Mlmmj 1.3.0 has been released, offering a small number of bug fixes and enhancements. Mlmmj 1.2.19.0 has been released, offering a small number of production-tested bug fixes and enhancements. A beta release for Mlmmj 1.2.19 has been published. Please help test it, and report bugs and successes. This release fixes three bugs. Current users of 1.2.18.0 are encouraged to upgrade. Mlmmj is a simple and slim mailing list manager (MLM) inspired by ezmlm. 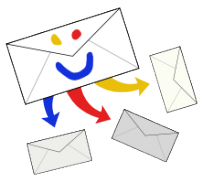 It works with many different Mail Transport Agents (MTAs) and is simple for a system adminstrator to install, configure and integrate with other software. As it uses very few resources, and requires no daemons, it is ideal for installation on systems where resources are limited, such as Virtual Private Servers (VPSes). You can read more about Mlmmj in the documentation section. It is released under the MIT license, so can be freely downloaded and modified. If you do modify it, we'd love it if you'd share your changes with us. Visit the development section of the site for more information. If you need help with Mlmmj or have questions about it, check out our support section.